"From the ashes we rose." 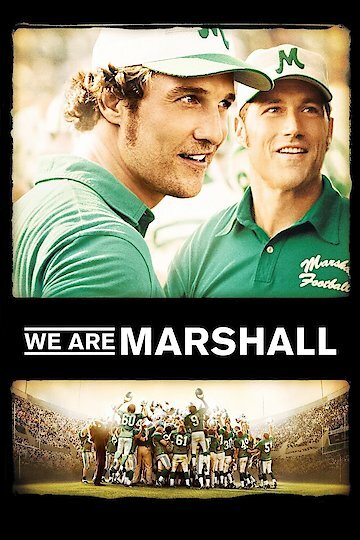 We Are Marshall is the true story of the Marshall University football team in Huntington, West Virginia, known as the Thundering Herd. Marshall was up against the Pirates of East Carolina University. Marshall players were on their way home, licking their wounds after another loss. During the flight, the DC-9 that carried the team, tipped its wings into trees growing along a ridge and crashed on November 14, 1970. There were no survivors from the wreckage found in a gully, only one-mile away from the runway in the Tri-State Airport in West Virginia. Rick Tolley, head coach for Marshall, five of his assistant coaches, the athletic director, Jim Schroer and his assistant, Donald Tackett; 37 university team members and five of the crew members of Southern Airways, taking the team to their destination on flight 932. A total count of 75 had died that evening. After the devastating accident, the president of the university, Donald Dedmon, wants to suspend all football program activity indefinitely. Students and the residents of Huntington want to carry on. Students who did not die in the accident wanted Dedmon to reconsider. Hearing the multitude of pleas to keep the program going, Dedmon hires a new head coach, Jack Lengyel. Red Dawson is the only surviving member of the coaching crew that did not attend the game the night of the fatal crash. With his help, the newly formed team and staff hope to win games in respect of those who died. The law that states young freshmen cannot play varsity football was lifted, in honor of the new team’s formation. The NCAA ruling that prohibits freshmen play has since been abolished. On the new team, there are 18 players from the original team, walk-on players from Marshall’s various sports programs in the university. The Thundering Herd proudly takes on opponents, but loses their first game of the season by a 29-6 fail. The Herd pulls together as a team and beats their opponent in a close win of 15-13 in their home stadium against Xavier University. We Are Marshall is currently available to watch and stream, buy on demand at Amazon, Vudu, Google Play, iTunes, YouTube VOD online.